If you believe that gays and lesbians are going to hell, you are anti-gay. If you believe we deserve anything less than full equality under the law, you are anti-gay. 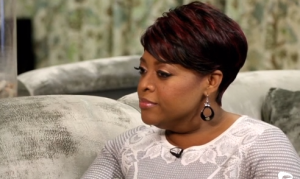 Why is this complicated for Sherri Shepherd? Sherri Shepherd, a cohost of The View, claims she’s not homophobic just because she believes homosexuality is a sin and LGBT people are going to hell. Shepherd sought to defend herself in a recent interview with Fusion host Alicia Menendez. When Menendez asked what Shepherd felt has been the biggest misconception about her has been throughout her career, she said it was that people had labeled her antigay — unfairly, in her opinion. Shepherd insisted she had no malice toward LGBT people, saying her beliefs are the result of her Christian background and though she hates the sin, she still loves the sinner. People grow up being taught bigoted, wrong things all the time. Whether they choose to learn the truth and change their thinking is their business, but good Lord, Sherri, it’s 2014. Also, “love the sinner, hate the sin” doesn’t even exist. It’s something that anti-gay religious people tell themselves because they don’t want to confront the fact that a central tenet of their belief system is hate. Stop saying it. Enjoy the video below, and for more on the subject of what is and what is not anti-gay, check out this great piece at The Friendly Atheist.